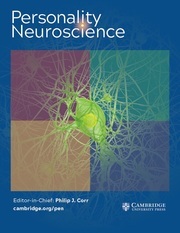 Personality Neuroscience is a fully Open Access journal that publishes papers in the neuroscience of personality (including cognitive abilities, emotionality, and other individual differences) concerned with understanding causal bases. Empirical papers focussed on the interface between personality and neuroscience are encouraged using any approach (e.g., experimental, longitudinal, genetic, genomic, gene expression, and epigenetic). Cross-sectional and largely correlational studies are considered only if they are highly robust, well-powered, and innovative. Through its focus on the equal importance of personality and neuroscience, Personality Neuroscience aims to enable the work of personality neuroscientists who no longer have to trade-off one side of this coin for the other in the search for a suitable publication outlet.